As ever it’s been a hectic couple of weeks and our few days off didn’t quite come off. We had 2 last groups turn up for short sessions, however we did manage to fish and had over 20 runs between us, nothing big, fish to upper 20´s. Jay and Gareth turned up at the last minute, hoping on the off chance to get a short 12 hr session in. Rods and tackle were soon prepared for them, we even tried to sort out their choice of clothing, Bermuda shorts and football tops not quite the best dress for carp fishing. There was a good bit of banter going on over a few cold beers, they even managed to have a few runs. They took to the Orellana and will be back later on in the year, hopefully prepared a little bit better next time. The next day novice German anglers Lorenzo and Sebastian arrived for a 24 hr session. One of their first questions was ´do you keep the fish´. – not the best of starts and it was soon explained (quite bluntly) that the fish go back. They managed to land 5 or 6 fish out of about 9 runs, both had new PB´s with most fish being 20 – 25lb. Soon after was another group pleasure angling. Yet again a great bunch of lads. Ian, Kev Paul and Steve We´re gutted we didn’t get a photo of Steve’s two-tone forehead – look forward to seeing you next visit. Next up was a group of 4 journalists and a camera man, another press trip from overseas with their first encounter of the Orellana. Some cracking anglers, one the record holder back home and a couple of WCC finalists, they will be back. Speaking of the WCC (World Carp Classic), Spain’s WCC qualifier takes place on The Orellana this weekend. Craig has been out helping Peter Staggs with choosing and marking out sections for the competition. Extrema Fishing Spain has a team in; Craig is to fish the qualifier with Spanish friend Carlos (Chino). Lee from Catch Carp Spain is teaming up with another friend Stu, word has it that there’s a little bit of a competition going on there. Well done to Peter and Andy for the hard work and effort gone into make the competition happen. Good luck to everyone taking part´. 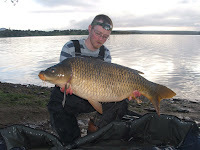 Its been a hectic few weeks for us here in Extremadura, firstly the Irish lads came for some Carp fishing. It was a battle against the elements on Brava, everyone was struggling, not only with runs but getting to fishable pegs as the lake was overflowing. After a bit of risky driving we managed to get 5 of them onto a good section of Brava. The temperature had soared and the carp were starting to show signs of spawning, however the lads stuck at it. 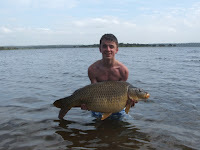 It payed off for Young Carl,16, his first ever Carp fishing session and he landed a 41lb Carp. Some of the other lads had a few runs, unfortunately losing a few fish; Gavin in the meanwhile beat his PB 3 times over the session. That’s all the Carp fishing we have managed to do since, all other groups of anglers were to visit for either Barbel or Pleasure fishing. Ken and John were the first of to arrive, considering they only fished from around 10AM til 6ish, they didn’t do too bad, well for takes that is!!! The biggest fish they were to land was only 9lb. They struggled with the strong Barbel, only managing to land around 1 fish in every 7 takes. Next up was Andy and Chris, they enjoyed their chilled out week of pleasure fishing, so much so they told their guide to bugger off several times. 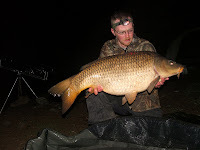 They caught Barbel, some Crucians and Carp with nets to over 100lb and again lost many fish. In the meanwhile The Orellana has been fishing its head off, friends have been bagging up with up to 12 runs a day with fish to around 50lb. Disabled Andy has had a new PB mid fourty lb fish. We have only managed 8 days Carp fishing since November last year so we are hoping for a bit of the action this next week, our next pleasure anglers don’t arrive until next weekend, so we’re going to hit The Orellana.